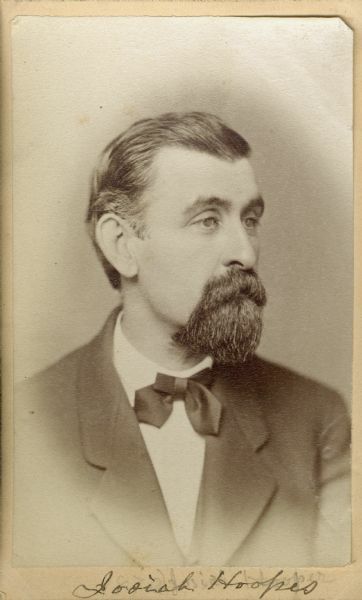 Carte-de-visite portrait of Josiah Hoopes (b. 1832, death date unknown), American botanist. In 1853, he established a tree nursery in West Chester, which is now the one of the largest in the country. He was a founder and seven-year president of the Horticultural Association of Pennsylvania. His treatise "Book of Evergreens," is considered to be the standard for the subject. Seen here wearing a bow tie, sitting in three-quarter profile. Handwritten inscription at the bottom reads, "Josiah Hoopes." Photographer's credit on back reads, "C. Aldred Garrett, Artist and Photographer, West Chester, PA. In ordering duplicates, please sent this No, 15996." From album of portrait photographs collected by Lapham depicting scientists and artists, ca. 1860-ca. 1875. Images include portraits of geologists, botanists, sculptors, and authors.